While making my first tote bag, my mind started to drift to my next creation. 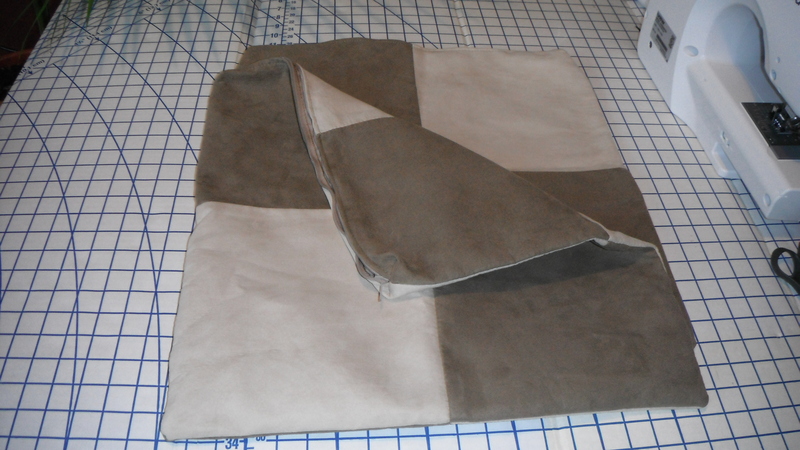 My auntie gave me two suede pillowcases that I can convert into a tote bag. As my mind starts racing to the finish line, I decided that I’m going to use the blocking technique that’s very popular now, and in the 80’s. Although, I had a little help with this decision from the pillowcase. No, I’m not crazy, but the fabric spoke to me. I think a matching clutch or zipper top wristlet is in order since the zippers are already there. I would hate to get rid of them, and the recycling capabilities are endless! There are some small details that I need to workout, but the weekend project is a go! Join the challenge. I do trust all of the concepts you have introduced to your post. They’re really convincing and can certainly work. Still, the posts are very brief for novices. May just you please prolong them a bit from subsequent time? Thanks for the post. Thank you for your comment. I will take your suggestion under consideration. I think the tutorial section on my page will be helpful to you. I simply want to say I’m newbie to blogging and site-building and seriously enjoyed your page. More than likely I’m want to bookmark your website . You amazingly have wonderful stories. Appreciate it for sharing with us your web-site.